Mazda guts underneath should make for a wonderful sub-compact. After Toyota announced it would no longer offer the French-built Yaris hatchback after the 2019 model year, it seemed like the Mazda-built Yaris sedan would be the only Yaris we'd get in the US. Just a few days later, a rumor emerged that Toyota was planning to sell a hatchback version of the Yaris sedan, which is based on the Mazda2. As it turns out, the speculation was correct and Toyota has indeed revealed the new 2020 Yaris hatchback. If you're unfamiliar with the Mazda2 because you live in the US, let us enlighten you on why this is good news. The old Yaris felt dismal on the inside with shoddy materials throughout. Even with a five-speed manual in the sporty SE trim, we struggled to derive any enjoyment from it. This new Yaris is a completely different story. Power comes from a 1.5-liter four-cylinder engine producing just 106 horsepower and 103 lb-ft of torque sending power to the front wheels through a standard six-speed automatic transmission. We wish the Yaris hatchback offered a six-speed manual like the sedan but a six-speed auto is a massive improvement over the old car's four-speed box. 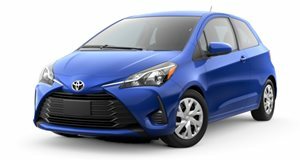 There is a Sport mode but the Yaris' true skill is the ability to achieve an EPA-estimated 40 mpg on the highway (an improvement of four mpg). It certainly won't be quick but the Mazda2 is an enjoyable chassis to play with on a tight back road. The body is comprised of 65% ultra-high tensile steel for high structural rigidity, allowing the MacPherson front struts and torsion-beam rear suspension to be tuned for comfort. The Mazda-derived interior is also a massive improvement which includes standard smart entry with push-button start, intermittent wipers, tilt and telescoping steering wheel, illuminated vanity mirrors, a backup camera, first aid kit, and seven-inch touchscreen with Apple CarPlay, Android Auto, and SiriusXM radio. LE and XLE grades can even be fitted with navigation via an optional SD card. The whole car measures a petite 161.1 inches long, making it easy to squeeze into tight parking spots. It is still 2.4 inches longer than the outgoing Yaris hatchback, providing a spacious 15.9 cubic foot hatch, which is more than you get in the trunk of a Camry. The 2020 Yaris hatchback includes Toyota's three-year/36,000-mile warranty and will make its official debut later this month at the 2019 New York Auto Show.